I have been trying to eat healthy lately. I have found that my body just can’t take ice cream, heavy sweets, and greasy meals like it used to. 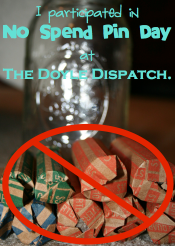 It’s not worth feeling icky to give in to my cravings for junk food. So I am just not eating junk. Yes, I may eat the occasional French fry from Tim’s plate, but I won’t order a whole portion myself. This healthy lifestyle is fine when I am at home, but what about when I am on the road? My first recommendation is pack sandwiches. It is so easy to go to the grocery store, get some Boar’s Head black wax cheddar cheese (my favorite) and roast beef, and you are good to go! I always make sure to get some fruit as well. Apples, grapes, and berries make for great on-the-go travel food. I also grab something salty (like mixed nuts) and sweet (chocolate or Werther’s Original Caramels allow for just the right amount of sweet). When you pack, you know what you are going to eat, and you don’t have to stop as often. Win-win! Sometimes, however, it is impossible to pack food before leaving. We usually have this problem when coming back from a road trip. In that case, we are held captive by the fast food giants. Thankfully, they have started to carry really yummy and fresh salads. My favorite fast food chain is Wendy’s. There’s something so comforting about their baked potatoes. I’ve always liked that choice. 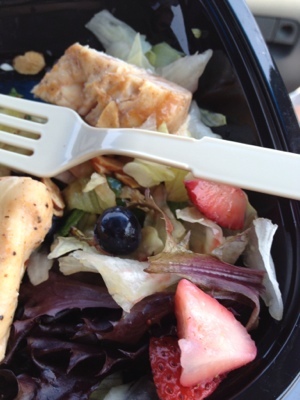 Now, they carry a strawberry almond grilled chicken salad that is absolutely delish! Forgive me for not snapping this picture before I ate most of the salad. I was hungry, and it was oh-so-good. 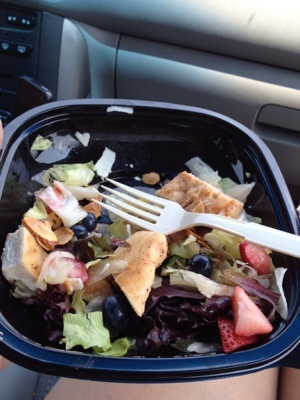 One more thing to love about Wendy’s: they do their salads in half sizes too! It’s nice that, even while on the road, you don’t have to give up your diet or healthy lifestyle! This entry was posted in Do-It-Yourself, Home, Travel and tagged berries, chicken salad, health foods, healthy, salads, Wendy's. Bookmark the permalink.